Located about 13 kms from Katra, Vaishno Devi is one of the most revered Hindu shrines in India. Surrounded by snow-capped mountains and greenery all around, this shrine is home for the three Hindu goddesses, Maha Kali, Maha Laxmi and Maha Saraswati. If you are planning a visit to Vaishno Devi, then make your tour even more comfortable by booking this exclusive 2 nights and 3 days package. Visit the pious caves of Maa Vaishno Devi and nearby holy places and indulge in the spirituality. It is a prime 3 star hotel, located at a distance of 2 KM from Katra Railway Stand and 1 KM from Katra Bus Stand. The hotel offers a comfortable accommodation for the guests with each room having all modern amenities. The hotel is ideal for leisure travelers and devotees. On arrival at Jammu Airport, meet our representative and get transferred to Katra directly. After reaching there, check-in at the pre-booked hotel and relax overnight. 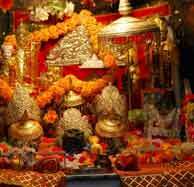 After taking an early morning breakfast, proceed for "Mata Vaishno Devi" Darshan. To reach here, you can trek, take ponies or chopper (on direct payment basis). After Darshan, head back to the hotel for dinner (on direct payment basis) and overnight stay. Enjoy breakfast, check-out and get transfer for respective Airport to continue with your onward journey.